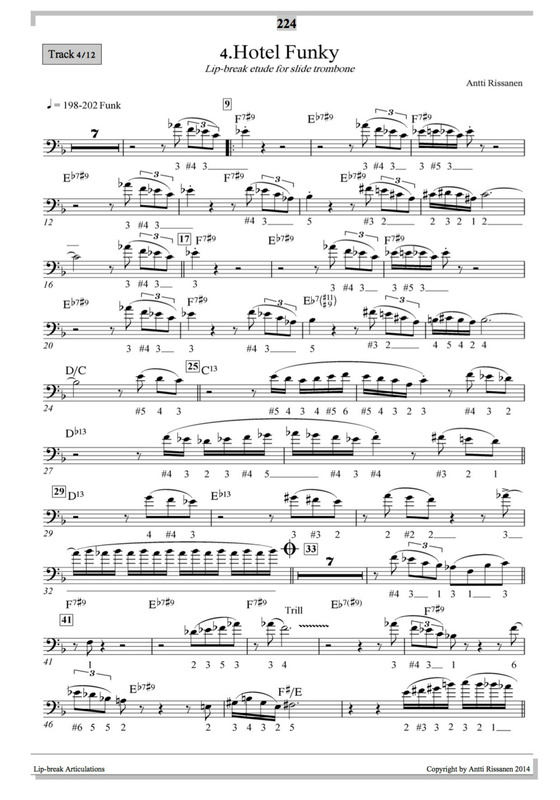 I became a trombone player for various reasons, but one of the most important cases was when I heard Frank Rosolino's solos on Tutti's Trombones (Bainbridge, BCD2049). His playing was just amazing! Now, about 25 years later, I feel really proud to be dealing with the slurring issues, which is very commonly known to be Frank's trademark! 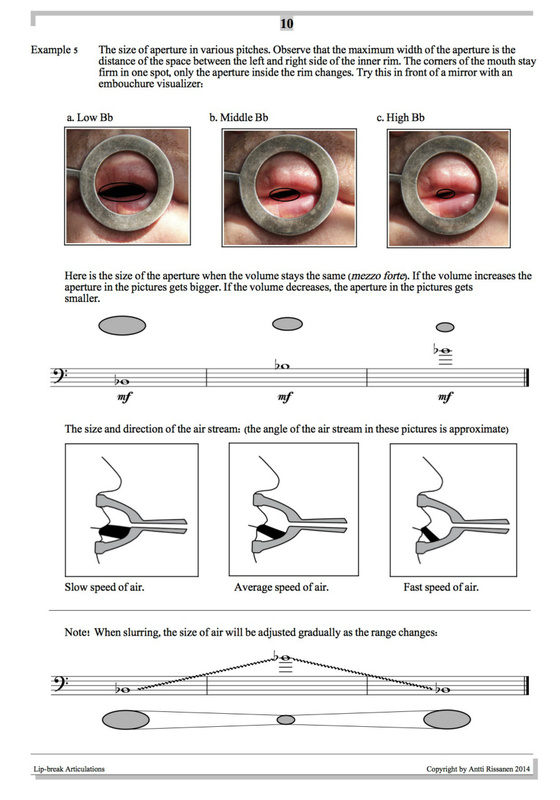 My book "Lip-break Articulations" includes 238 pages of slurs and a CD. It was born as result of a 12 year research on slurring as a doctoral study for the Sibelius Academy in Helsinki, Finland. This project also included years of studies at Hochschule für Musik “Hanns Eisler” in Berlin and The New School University in New York City, USA. Jiggs Whigham, Conrad Herwig, Sam Burtis, Petri Juutilainen, Markku Veijonsuo, Simo Kanerva, Miika Jokipii, Jukkis Uotila, Jari Perkiömäki, Jarno Kukkonen, Otto Donner, Bill Watrous, Bart Van Lier, Bertil Strandberg, Robert Bachner, Nils Landgren, Jari Hongisto, Pauli Rukakoski,Tom Bildo, Pekka Leander and Darren Acosta. 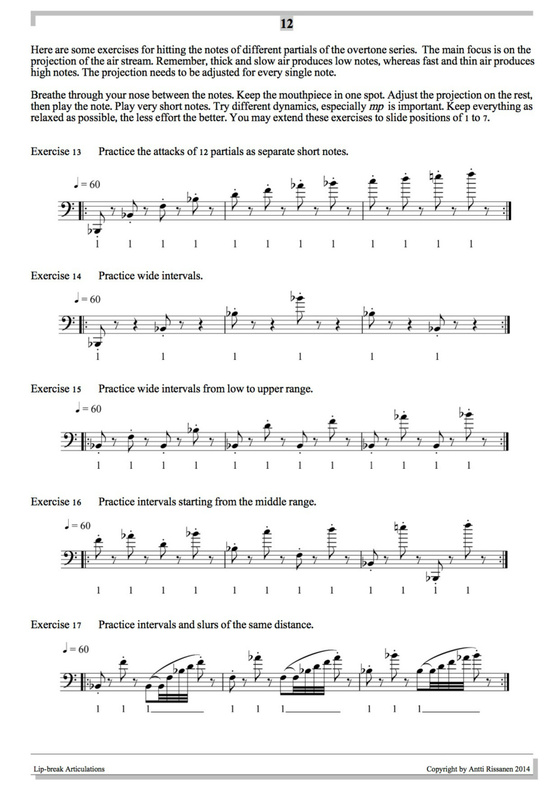 I hope you enjoy studying this book and wish you much fun using this material in your everyday trombone playing! 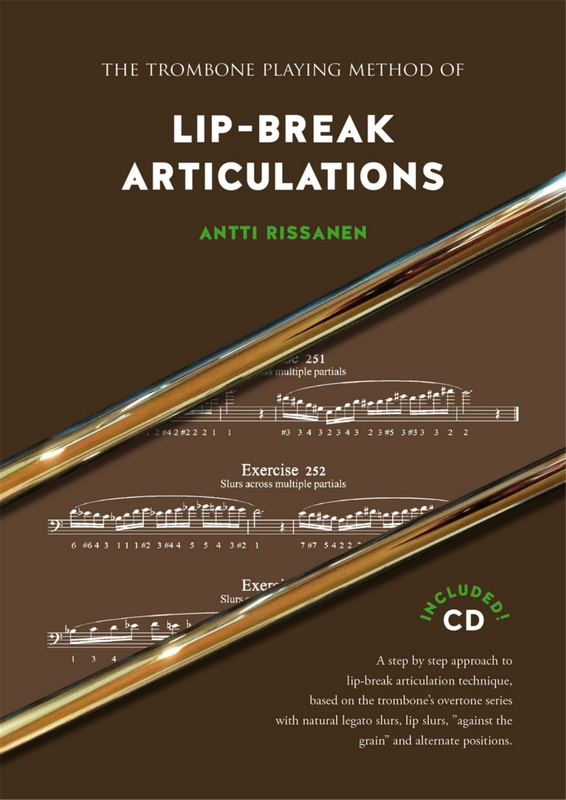 This book is a study of the basics and the characteristic use of the lip-break articulation. Lip-break is a name for non-tongued legato articulation between two partials. This is commonly know as a slur. The notes of the slur are articulated with lip-breaks, which produce a smooth and consistent legato articulation. A slur of multiple partial includes multiple lip-breaks. Lip-breaks are built into the trombone. 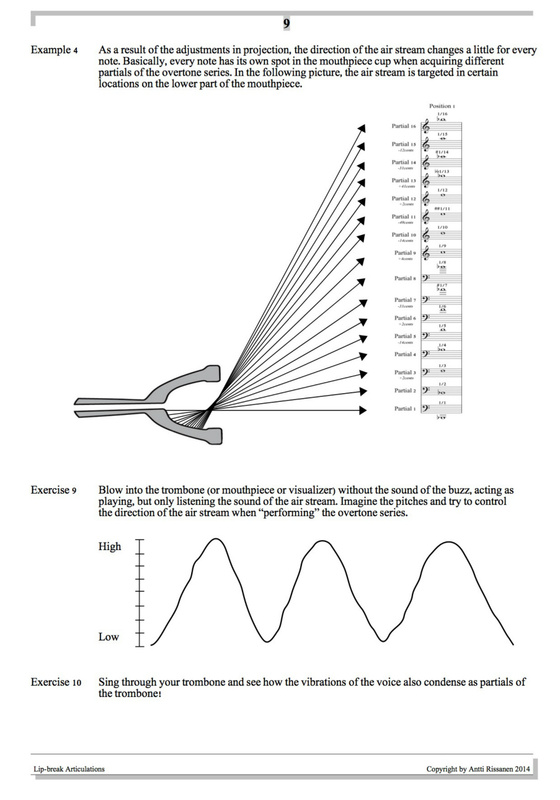 “Cutting” the overtone series with lip-breaks makes it possible to play the trombone with less tongue. Lip-break articulation technique combines partials and slide positions for slurred passages. The first rule of thumb is to change the partial for every note. The second rule of thumb is to use neighboring partials. The third rule of thumb is to use tonguing only to start a slur (or to connect separate slurs). However, you may always use a legato tongue of du or du-dl for making the rhythmic outcome of the slur stronger and more precise. But, in some cases it is better not to tongue, since some phrases can be played much faster and easier without tonguing. You may think of a “rapid fire” – by tonguing only once you will get many really fast notes!The lip-break articulation works at its best with fast legato passages like trills, shakes, turns, passing notes, slurred pick-ups and slurred patterns of scales and arpeggios as well as with slow legato melodies. This book covers a large selection of slurs and divides them in certain categories based on their musical meaning. The characteristic use of slurs greatly depends on the range, since certain slurs work best in certain ranges. In general, the slurs work easiest from middle to high registers, where the overtone series have small intervals, like thirds and seconds. The number of the alternative positions increase the higher we reach in the overtone series and this is why there are more options for slurs in the high register. However, the slurring technique cannot be always used systematically in all situations and sometimes another technique may be a better choice (like tonguing along one partial “with the grain”). For learning the slurs, this book follows a step by step approach of learning the use of lip-breaks. This is done by starting with slurs of two partials and adding a partial one by one and making the slurs longer and more demanding when progressing through the book. The theory and the basics of how to slur will be covered in the beginning. It is followed by warm-up exercises for slurring, covering some preliminary exercises for slurring with one position and with changing slide positions. I suggest you to read properly all the text in the theory before getting into the playing. Also try these exercises along with the text. I hope you will find them useful for you and for your students! 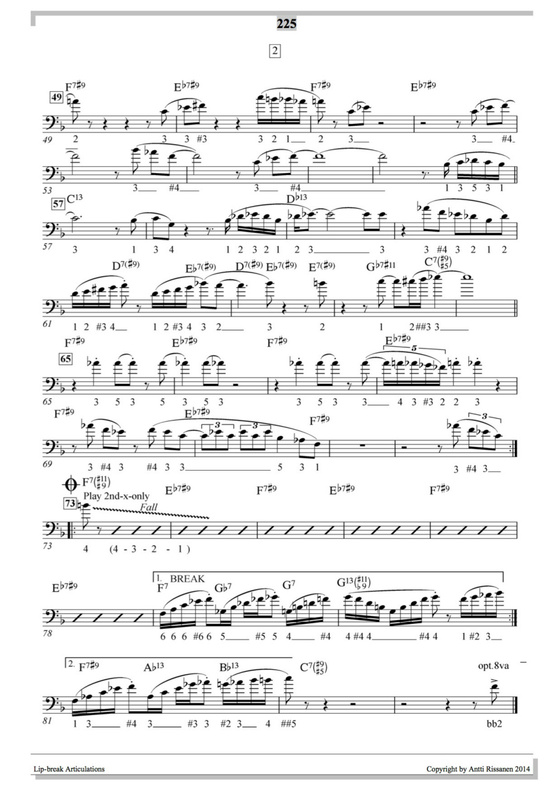 At the end of the book, there are 8 demanding etudes in various styles of jazz music. 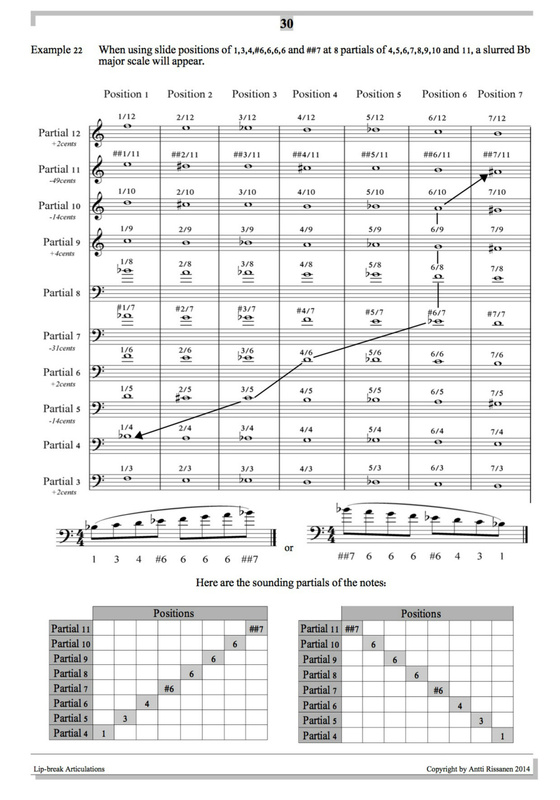 Please use the play-along CD when practicing or performing them. You can also listen to me playing them from the CD attached to the front cover. All along the exercises of this book, all slide positions will be marked to make the slurring with alternative slide positions easier. There are also examples of slurred phrases of solos of some famous jazz trombonists. I have added the publishers of those recordings to these examples so that you can listen to those solos from the original recordings. 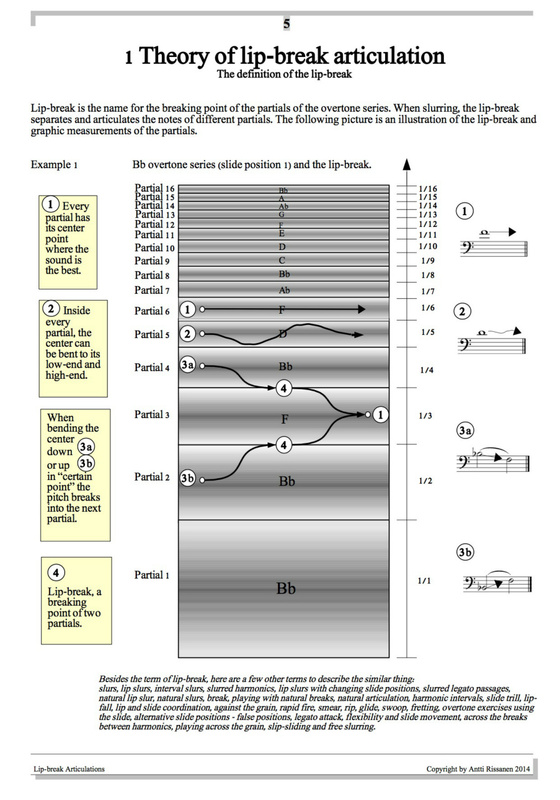 To be able to use the lip-breaks in everyday music making, it is important to understand how the overtone series and its partials work and play a major role in articulation and tuning in trombone playing. Study the intonation of the partials properly and make a good habit of correcting the intonation right from the beginning. This will make playing with alternate positions much more fun. Also the flexibility works better when the positions are locked-in properly. 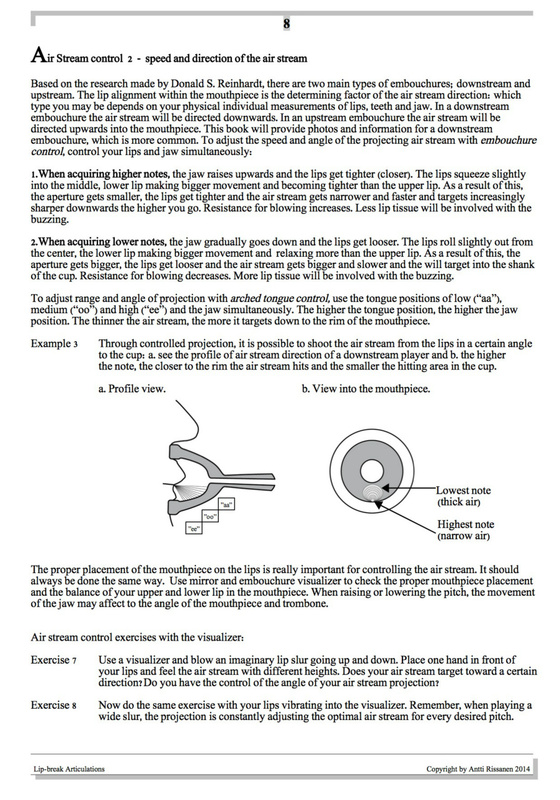 Mastering the trombone’s slurring will help in many areas of trombone playing; sound, range, lip-flexibility, intonation and technique for smoother and faster playing. When the lips have a good sense of flexibility, the lip-break is easy to execute. Going from one partial to another one should become effortless. The flexibility should be studied slowly, paying close attention to steady blowing and controlled projection of the air stream. The chapters in the beginning handle the speed, size and direction of the air stream. These are the most important elements for a good foundation of lip-flexibility and range. I hope you will get great ideas on how to improve by using the lip-break articulations. Here you’ve gotten the principles and exercises as well as some examples. The goal would be finally finding your own personal ideas, your unique way of using them. Make them sound as your own. The choices are endless! 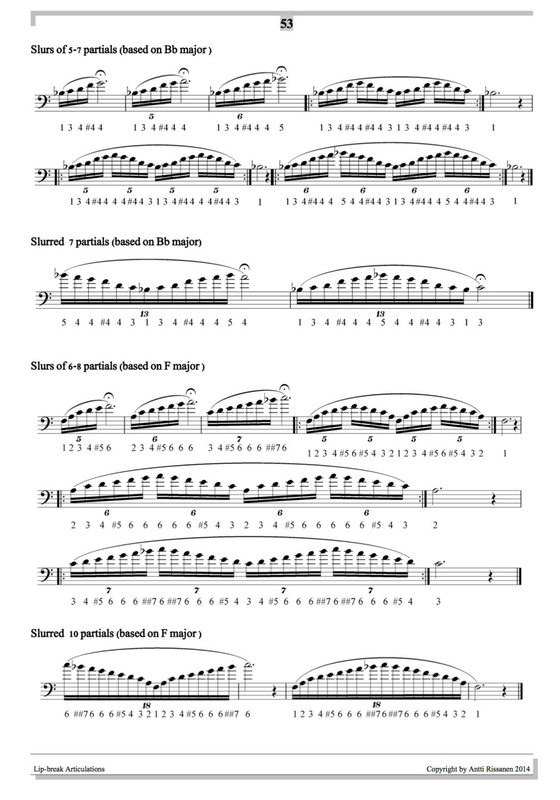 Following line can be played fluently and very fast in full legato without using the tongue. The line is built over lydian b7 sound. The slide positions are marked under the line. At the moment the book is available through Seaside Music (based in Finland) and soon available through dealers in the States. If you are interested in getting one or you have some ideas about the book, please e-mail me! Hotel Funky, lip-break etude #4 (mp3).